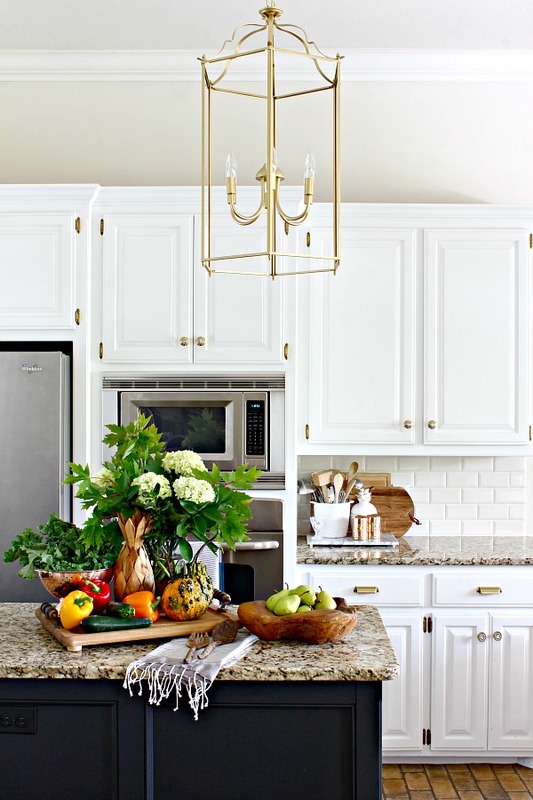 It's one of my favorite weeks of the year... another round of Blogger Stylin' Home Tours! Many thanks to Lindsay at The White Buffalo Styling Co. for hosting this tour. If you're coming over from Britt Kingery, welcome! If you're visiting for the first time today, let me introduce myself. 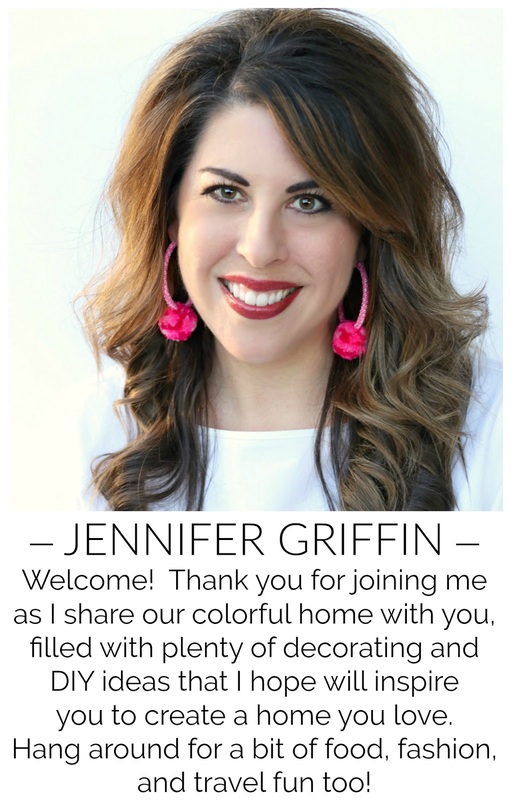 I'm Jennifer and I live in Edmond, Oklahoma, where my husband is a Baptist minister, and we have two teenagers, a son (dimples) and a daughter (tangles) . 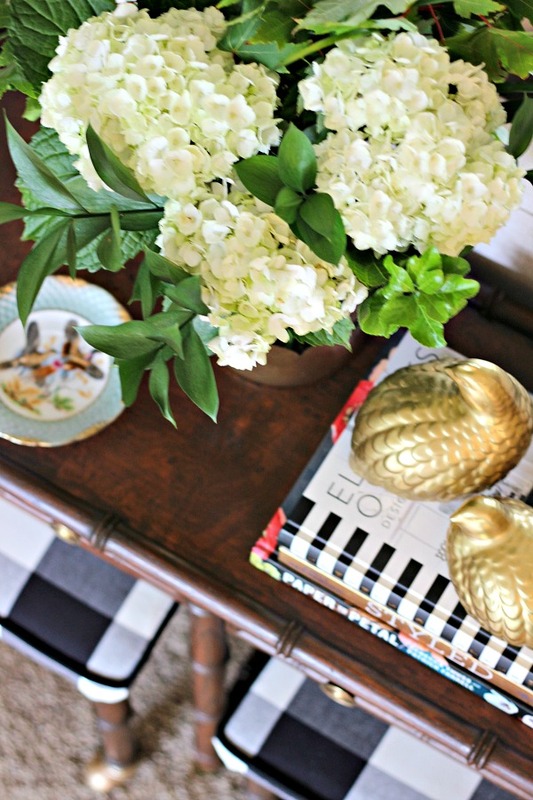 I adore bold color and mixing patterns, get excited about a great Craigslist score, and am not afraid to get my hands dirty with a DIY project. 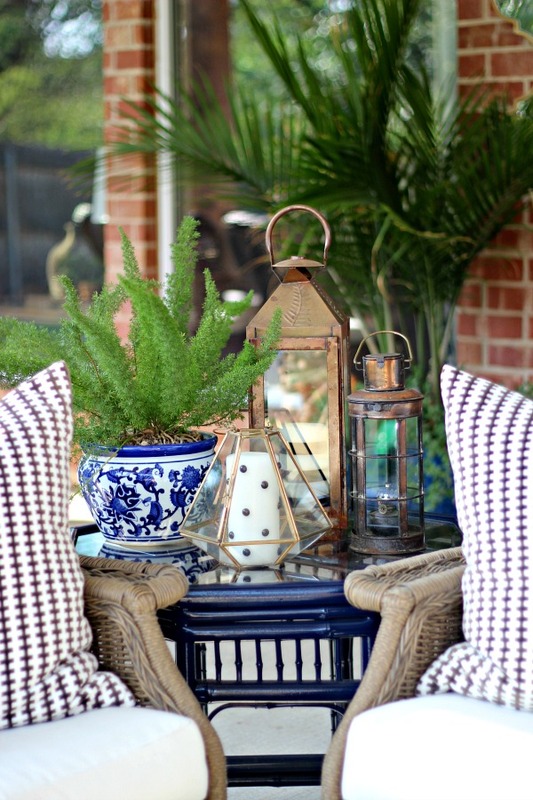 I shared Part 1 of our Fall Tour a few weeks ago, but I've switched a few things up since then so I'm sharing a few of the spaces again, and I'll share our patio all decked out for Fall today. Previously I had some Monstera leaves in the Entry, but they finally bit the dust so I replaced them with a fresh arrangement of bargain flowers and branches trimmed from a tree in our yard. 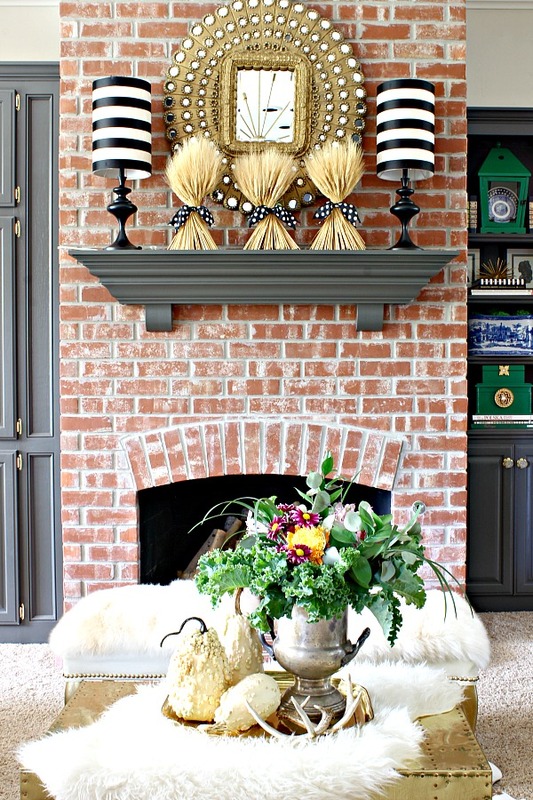 I didn't do much to the shelves in the Living Room except add a few sugar pinecones to the mix. I also found a new lamp that's the perfect size for this spot at Gordmans. They were kind enough to allow me to pick out a few new things for my tour. 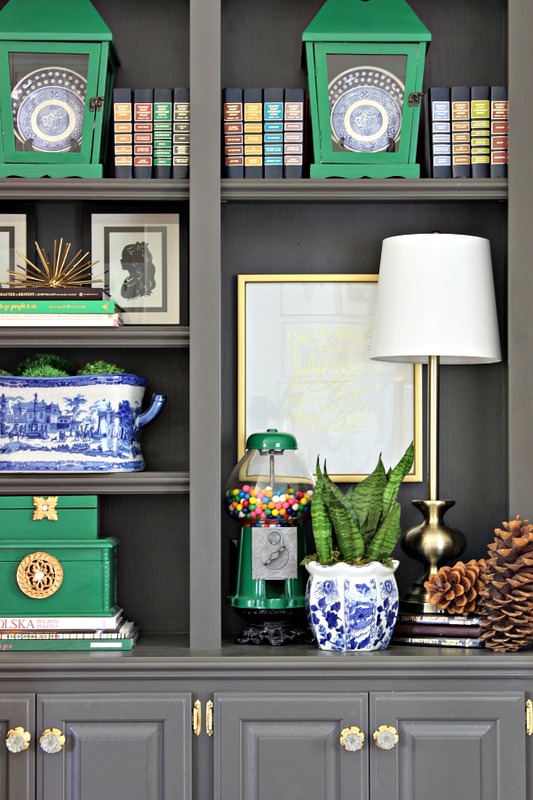 I love adding lamps in bookshelves when possible! I couldn't find it online but they have so much more available in store anyway. I've found some treasures there over the years, including the lamps above on the mantel right now. 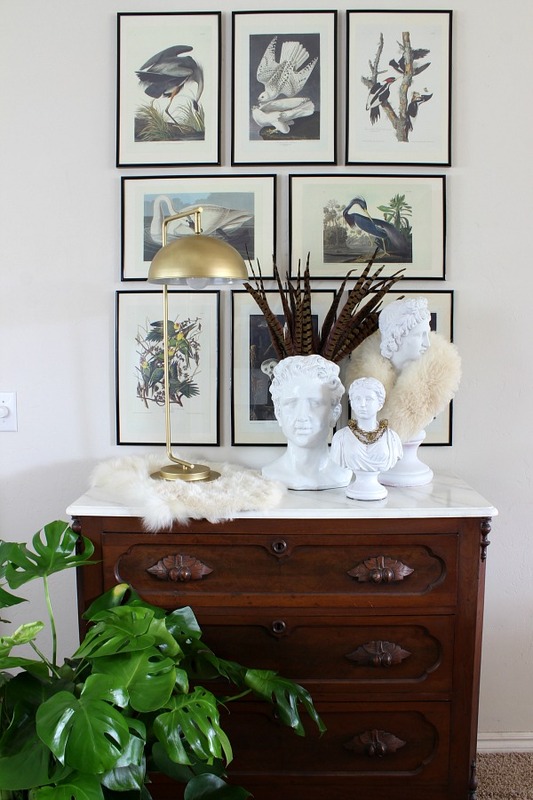 I tweaked the styling on the antique chest as well. I wanted to add a lamp when I originally styled the top, but any of my lamps with drum shades just covered up too much of the bird prints. 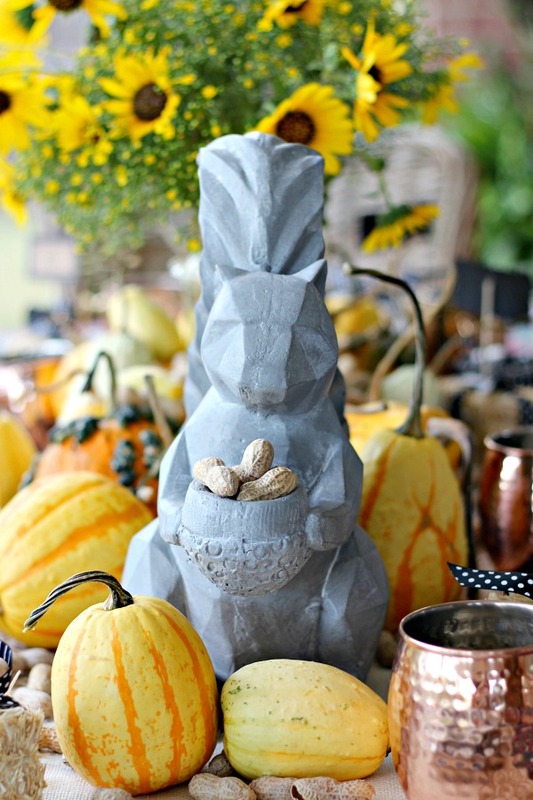 I found this one at Gordmans too, and it's just right to add some light while not taking up much visual space. It was originally oil-rubbed bronze which was a pretty finish, but with the dark chest and dark frames I needed a brighter color. 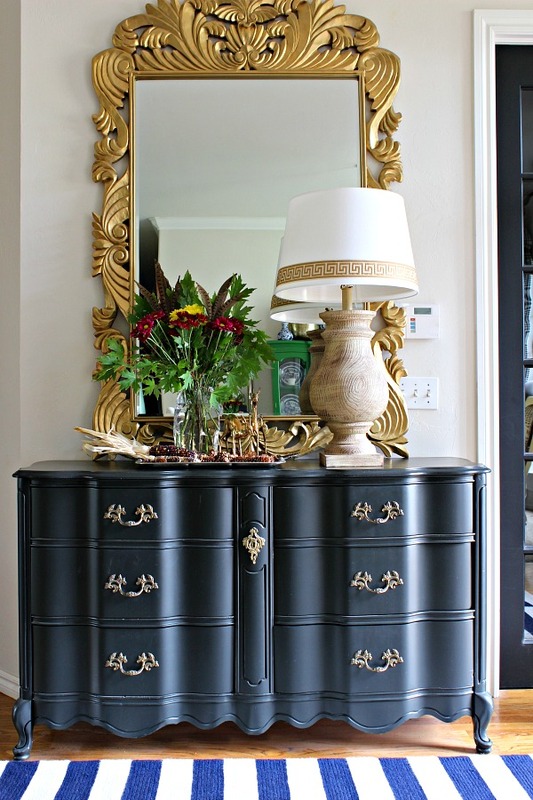 A quick coat of my favorite gold spray paint saved the day! 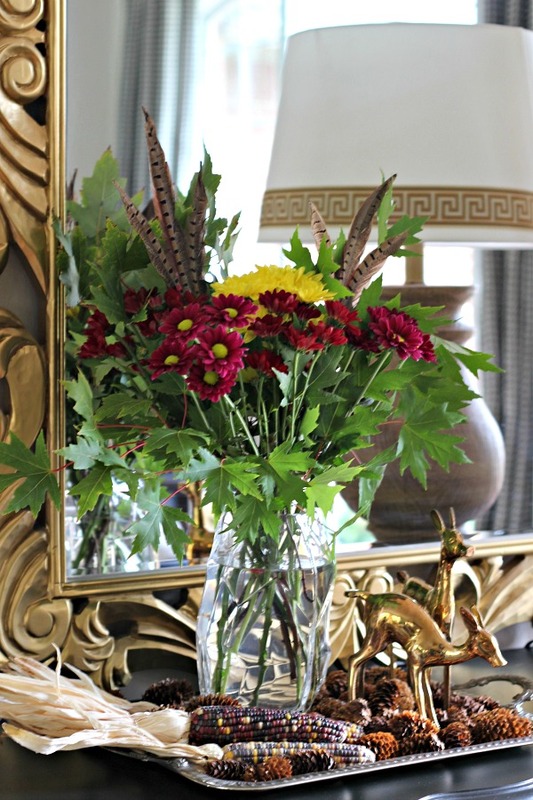 I set a simple centerpiece on our kitchen table where we eat most often. 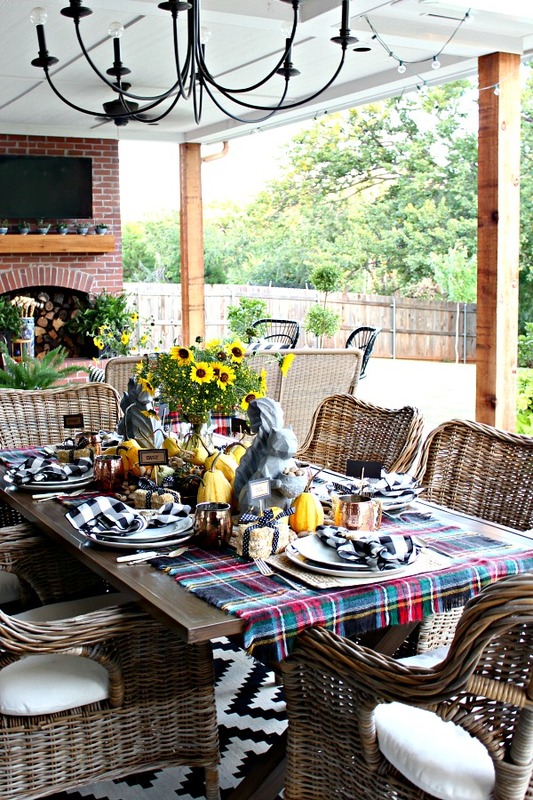 This is the first Fall that our patio has been completely finished, and I loved dressing it up for Fall. 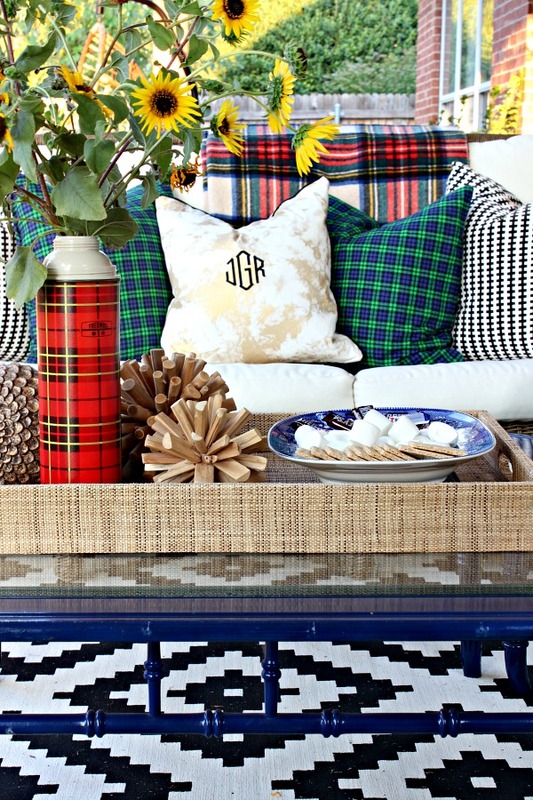 I added in some new green and blue plaid pillows with fabric from Hobby Lobby. 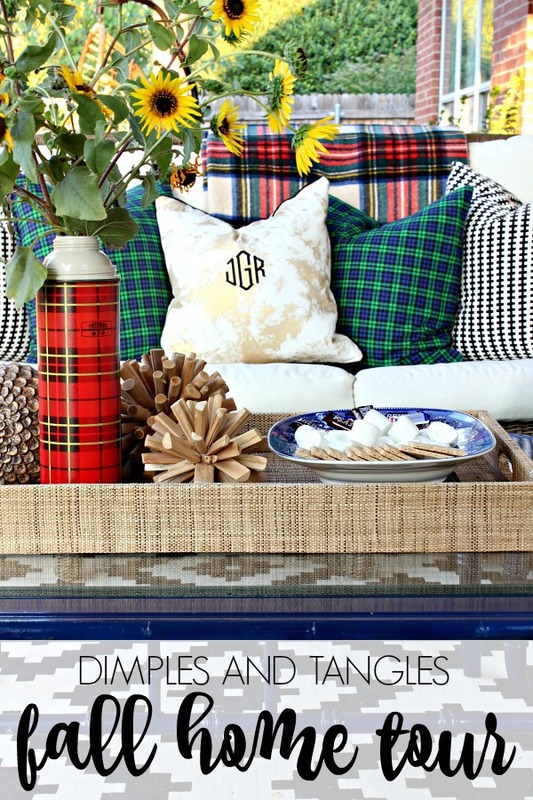 The green ties in all of my green accents, but the plaid cozies things up for the season. I think most of this will carry right on through Christmas, too! 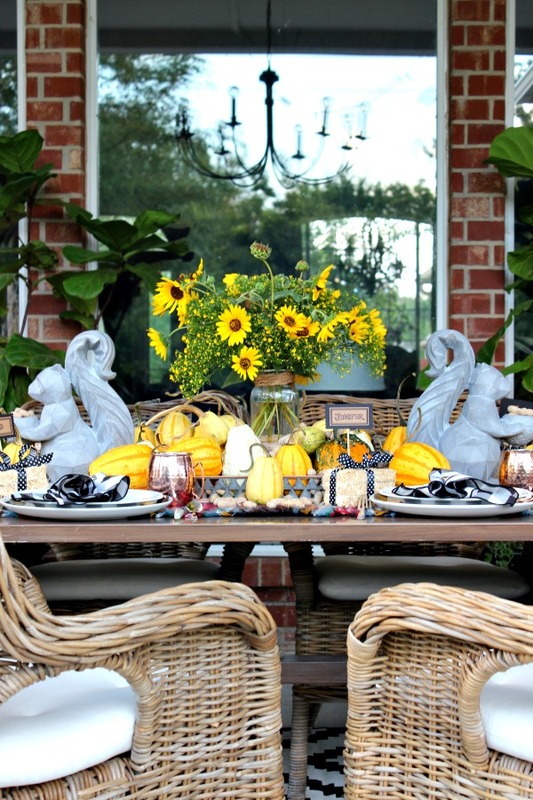 Last week I shared the patio dining area with you, all set with a Harvest themed tablescape. For the next stop on today's tour, I'd love for you to visit my friend Shannon Claire. I've always adored Shannon's style! Thank you so much for joining me today! If you enjoyed today's tour, I would be absolutely thrilled if you would follow along! Need more inspiration? Here's some previous Fall related posts. OMG!!!! Love, love, love them all!!! You are such an inspiration! You have out done yourself! These are the kind of posts I save to look at again over the weekend there is that much goodness! 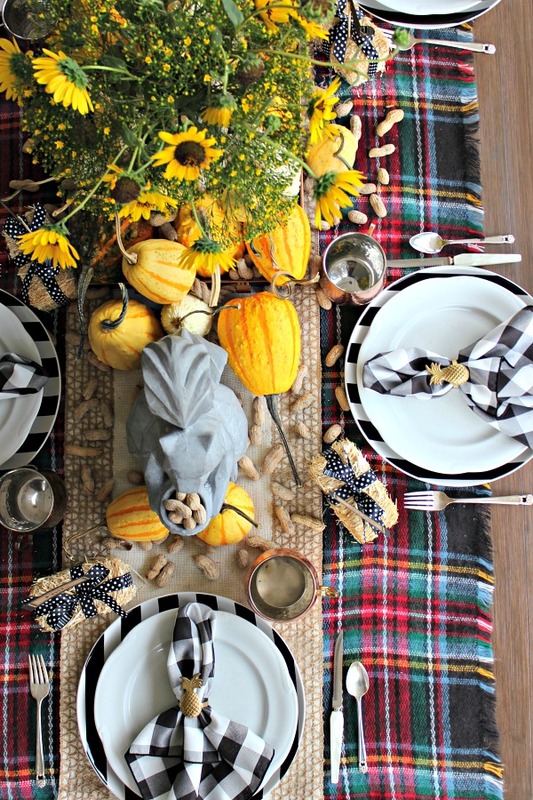 It's just the inspiration I need to start decorating for fall (cooler temps help too)! Thanks for a great tour! Beautifully put together Jennifer! I love how the bamboo piece came out! 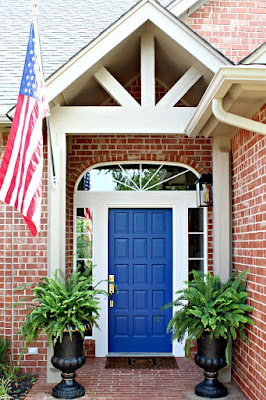 i just realized i pinned like crazy (scheduled) and forgot to leave you a comment so i am back! i LOVE your fall tour so much! 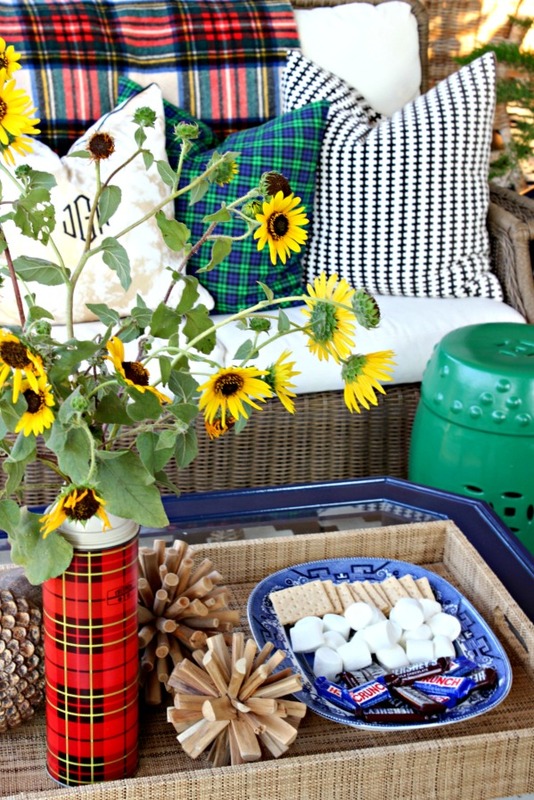 the outdoor fireplace and seating is so perfect, and that outdoor tablescape, too! 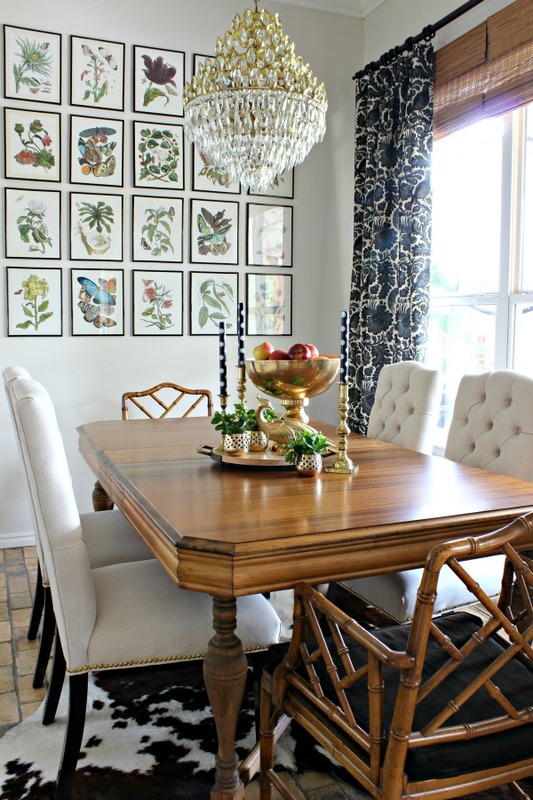 and i love seeing your new furniture gem in its place- it looks sooooooo good! The bamboo table and stool look amazing!! You did a fantastic job! 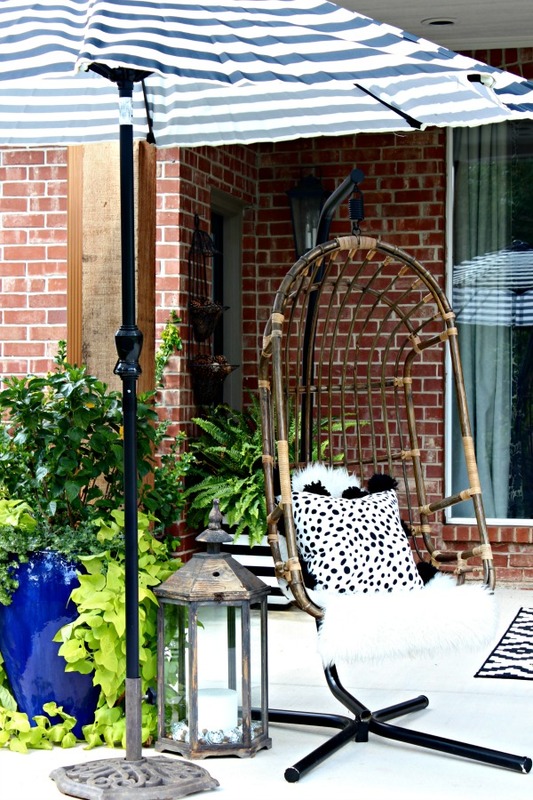 So hard to pick a favorite spot in your home Jennifer, but I must say your Outdoor space this year is just to die for! 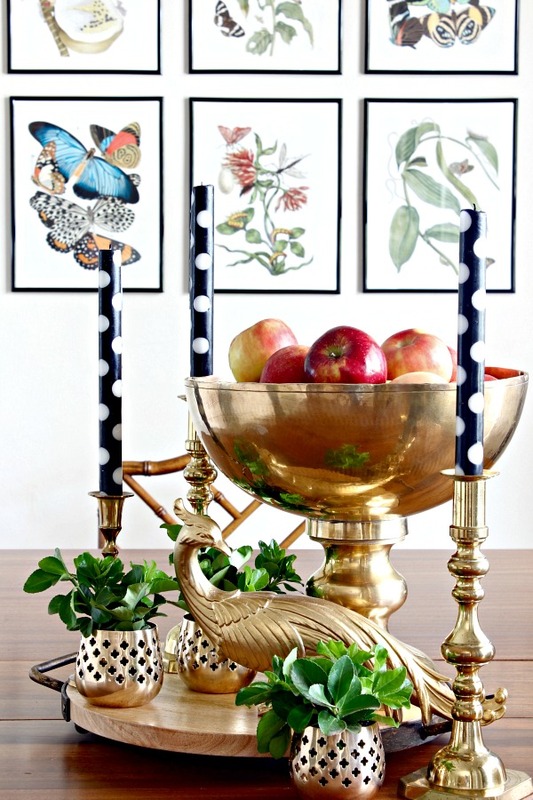 Your home is such a feast for the eyes! I love everything about it! Every photo is stunning! 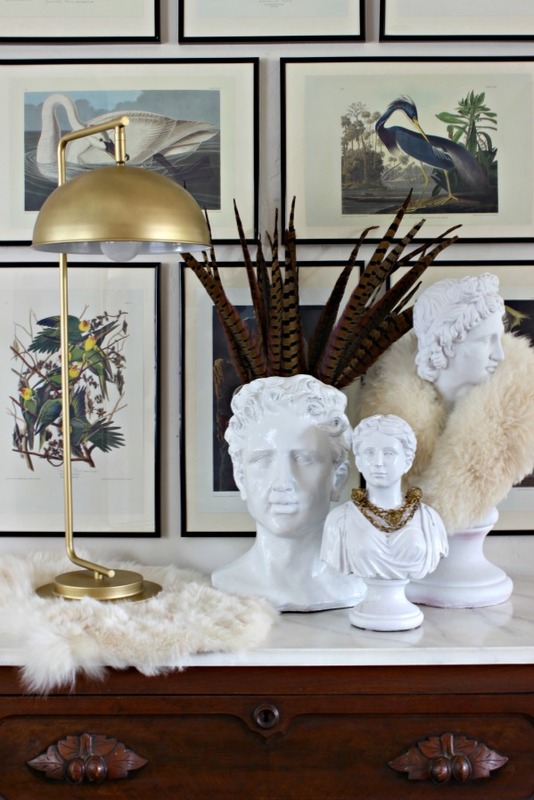 I think my favorite vignette is the busts and furs--so fun and unusual! 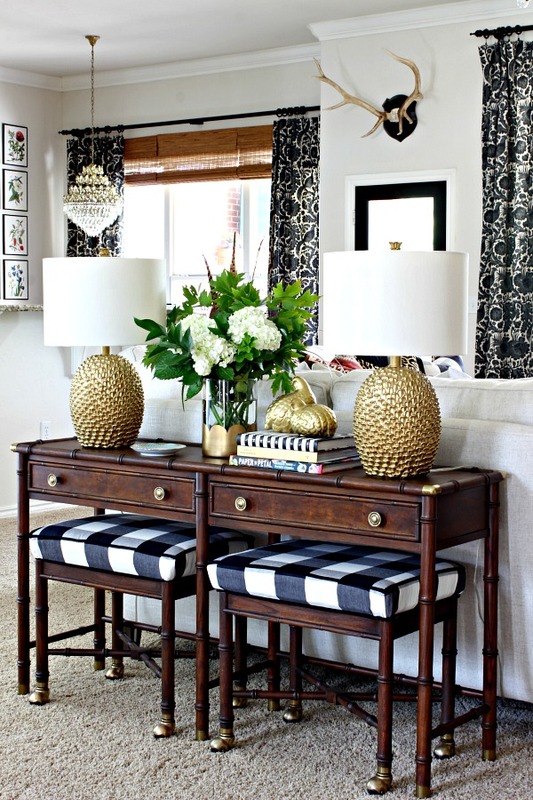 Your console and stools turned out beautifully. 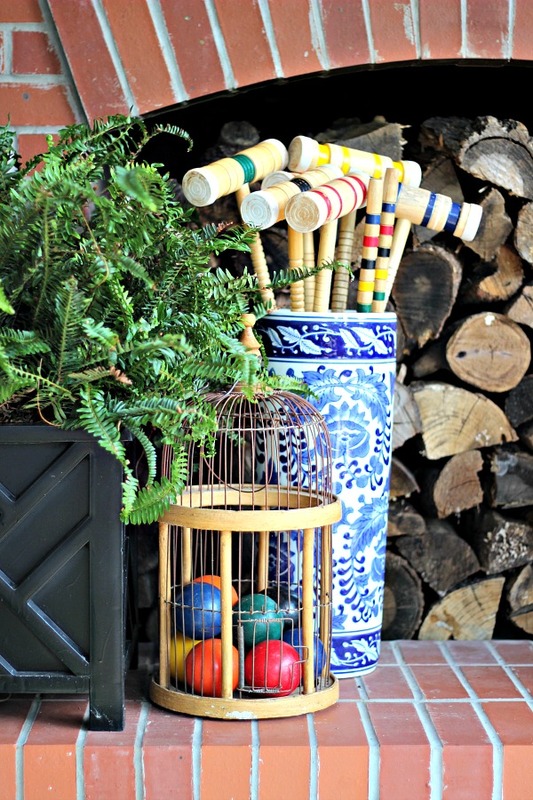 The outdoor space is wonderful, and I especially like the croquet mallets in the blue and white umbrella stand -- very clever! Oh my goodness! Eye candy galore! 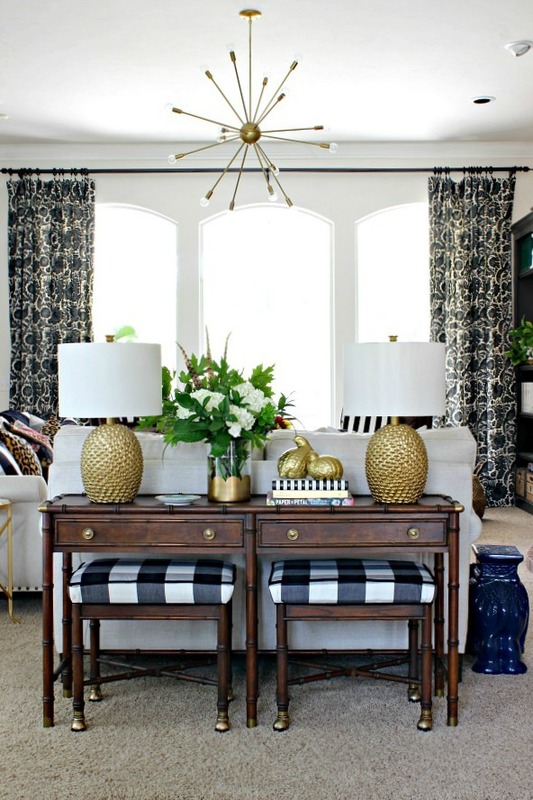 I'm absolutely loving your new faux bamboo console table in that spot - the gingham upholstery is perfection! 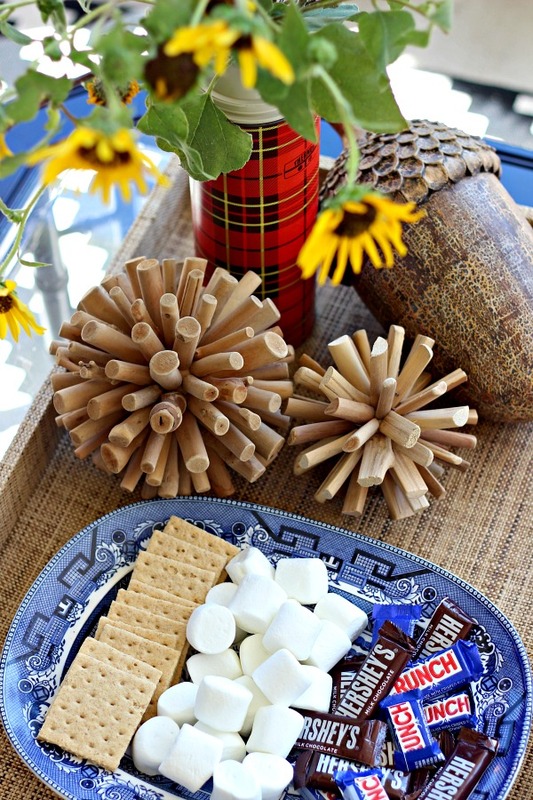 And I adore your kitchen table centerpiece, especially the polka dot candles! 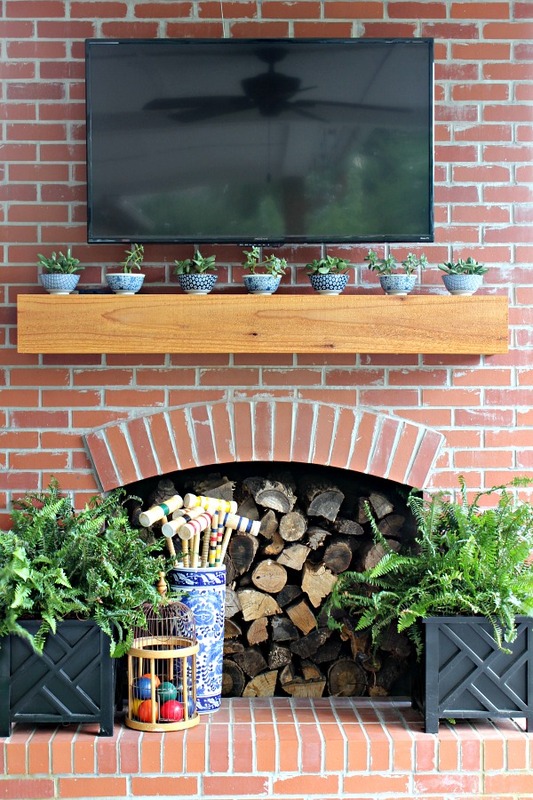 That bamboo sofa table turned out with sweet perfection. 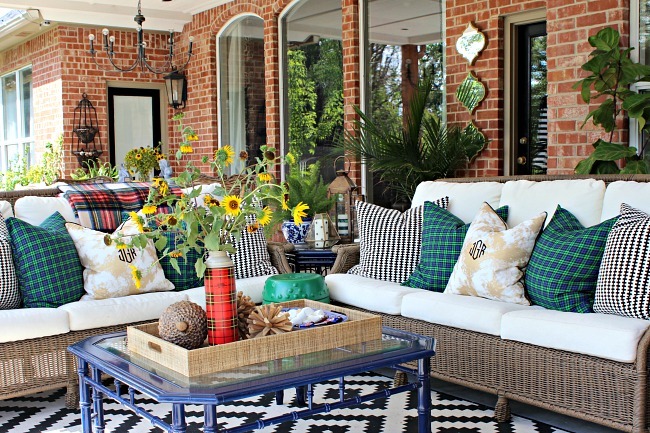 Trying to not be too covetous ~wink~ I know this sounds unkind, but I AM curious... all those pillows on sofas - inside and out - what do people do with them when they visit? When I'm at my bff's house I'll toss them aside - but when I'm visiting someone with an abundance of pillows I'm never sure what to do with them, because I cannot sit down without moving them. Maybe they're just for your photo shoot. People?? 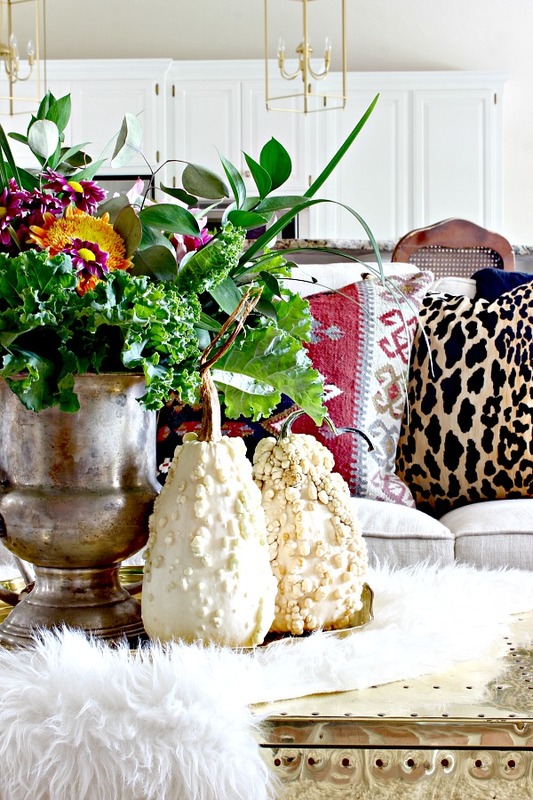 I wouldn't know about Kilim Pillows and Leopard Pillows before reading your blog. 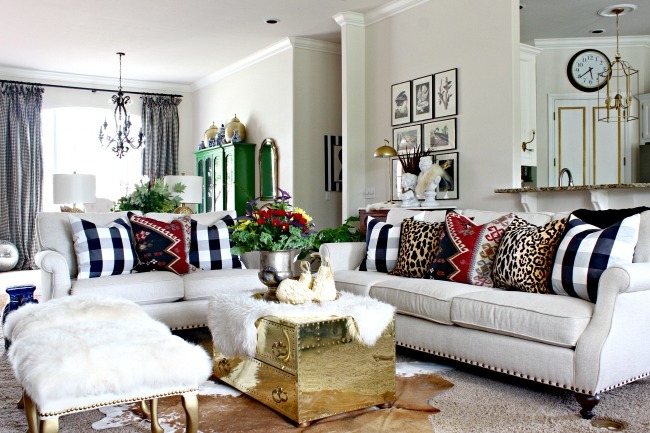 Now I am very much excited to watch the Kilim Pillows and Leopard Pillows cause of its beautification. 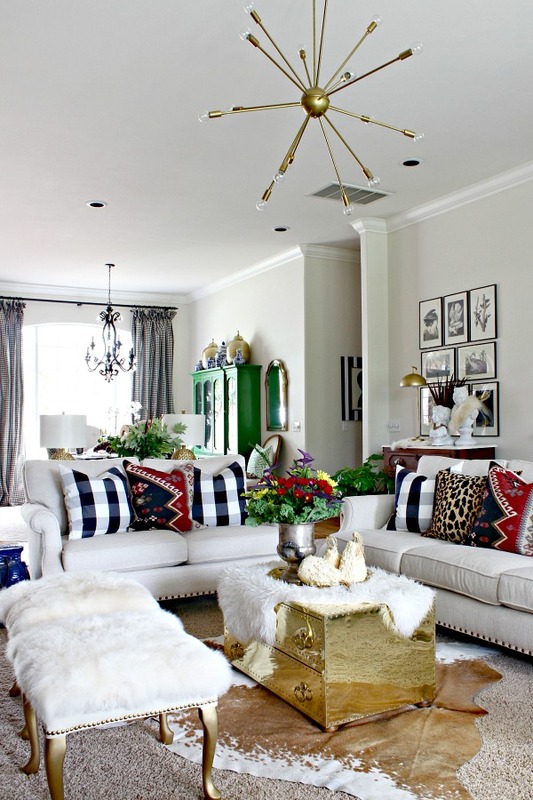 The Cowhide Rug is very familiar to me because I use this on the floor of mine home. It is very much comfortable and easy to clean.